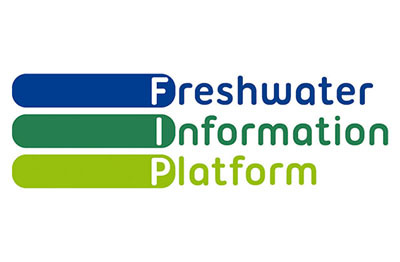 FRESHWATER BIODIVERSITY: Current biodiversity patterns for all freshwater taxa groups as well as predicted and past biodiversity maps for selected groups can be accessed from here. 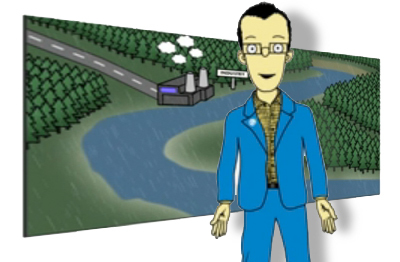 FRESHWATER RESOURCES AND ECOSYSTEMS: Background information on freshwater resources like precipitation, runoff and discharge as well as maps on rivers, lakes, wetlands, groundwaters and ecoregions can be accessed from here. 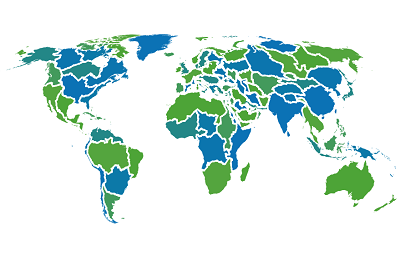 FRESHWATER PRESSURES: Maps and brief summaries of, for example, climate and land use change, pollution, water extraction, invasive species or water-related diseases can be accessed from here. 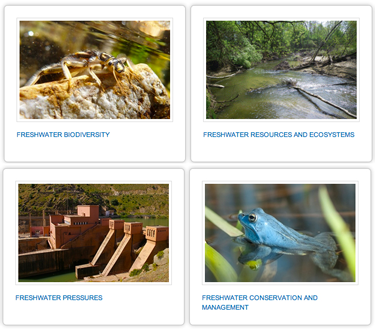 FRESHWATER CONSERVATION AND MANAGEMENT: Overview of protected areas, key biodiversity areas (KBAs), research networks as well as management and restoration efforts can be accessed from here. Thus, by selecting a particular chapter title you are given the opportunity to choose from a further selection of sub-chapter headings. When you select a specific map it will automatically open an associated profile page. This will provide extensive information about the map source(s), author(s), contacts etc. as well as linking to the interactive map interface and a related scholarly article. There are additional ways to find maps: "Keywords", "Select a chapter", "Search in all chapters". You can use the "Keywords" box that is provided at the bottom of the Explore page. Note that the keyword font size is proportional to the number of maps related to that particular keyword. Clicking on a keyword thus provides direct access to a list of related maps. Selecting a map opens a profile page, giving information about the map source(s), author(s), contacts etc. It also provides a link to the interactive map interface and a related scholarly article. The "Select a chapter" box is provided on the bottom right hand side of the Explore page. A selection list gives you the opportunity to choose chapters or sub-chapters of interest. Selecting a chapter gives direct access to the related sub-chapters, whereas selecting a sub-chapter provides access to a list of associated maps. Selecting a map opens a profile page, giving information on the map source(s), author(s), contact(s) etc. as well as linking to the interactive map interface and a related scholarly article. The "Search in all chapters" box enables you to use custom keywords to search for specific maps within all chapters using a full text search. The search results will present a list of related maps. By selecting a map a profile page will open. 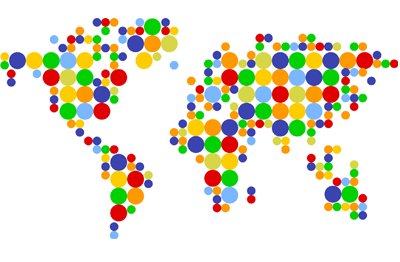 This will provide extensive information about the map source(s), author(s), contacts etc. as well as linking to the interactive map interface and a related scholarly article.